Manufacturer of a wide range of products which include fire alarm hooter, flame proof box, flameproof push button station, flameproof switch socket with top, flameproof socket with mcb and plug top and switch socket and plug top. Exclusive range of Fire Alarm Hooter with addressable & Conventional type that we offer is designed as to complete the demand of Fire Alarm Control systems in several areas of residential and commercial. Owing to our domain expertise we are providing our clients with an extended range of Flame Proof Box. Developed in strict compliance to the international quality standards, we make use of only premium raw material using advanced technologies. 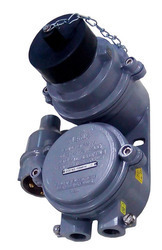 Also we have specifically constructed this junction box by applying LM6 aluminum alloy housing. Coming with a four way terminal block, the junction box is fitted with a synthetic rubber gasket that has been given an epoxy gray stove enamel finish. 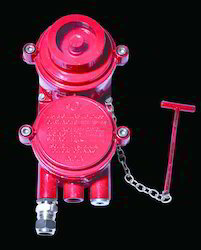 Facilitated with technically sound manufacturing unit, we have been able to attain prominence among leading are manufacturers, suppliers and exporters of a wide array of Flameproof Push Button Station. 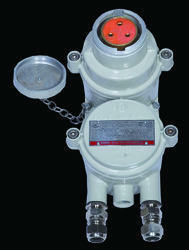 This product is manufactured with precision using fines grade basic material and components. Also, we employ sound techniques while manufacturing these products in consonance with the international quality guidelines. Our reputation in the market is largely attributable to our precisely designed and manufactured Flameproof Switch Socket with Top from our extensive collection of product. Our offered range is availed in a variety of sizes, dimensions and other such specifications to choose from. 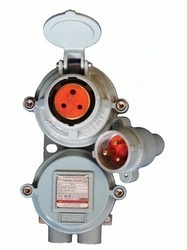 This socket with top is used in industries and houses. The offered qualitative product is precisely designed at our highly advanced manufacturing unit following industry defined guidelines. The offered range can also be availed from us at the industry leading prices. With an aim to offer quality proven product range, we manufacture, supply and export high quality Flameproof Socket With MCB and Plug Top. While manufacturing these products we make sure that best-in-class material is used. Furthermore, our professionals follow international quality standards during entire manufacturing process. Our offered range can also be availed at competitive prices and that too in different dimensions and sizes. We are a well-known organization that is engaged in manufacturing, supplying and exporting, high quality Switch Socket and Plug Top. All the offered products are designed and manufactured using quality-approved material and modern technology to ensure that final output meets with industry standards. Also, these products are thoroughly tested by expert quality controllers on different parameters to ensure flawlessness. 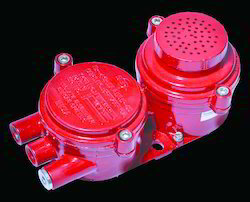 We have marked a distinct position in the market by manufacturing, supplying and exporting Flameproof Electronic Hooter. These hooters are precisely manufactured at our technically advanced manufacturing unit at par with the defined international standards. Clients can avail these products at industry leading prices and that too in variety of sizes and dimensions. 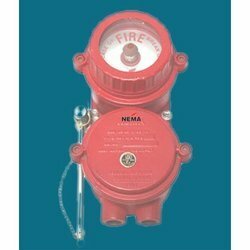 As per the variegated requirements of our clients, we are offering a broad collection of Flameproof Manual Call Point. This call pint is manufactured using excellent quality raw material and latest technology by our skilled professionals. In order to ensure quality, this product is stringently tested on various parameters by our experts. Apart from this, remarkable quality and unique design increase the demand of our offered range in the market.